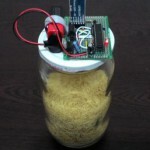 IoNeeds allows to turn your jar (yes, that antique device used to store rice, flour, and what not) into a connected object able to automatically let you know when it is empty, and possibly place online orders for you. 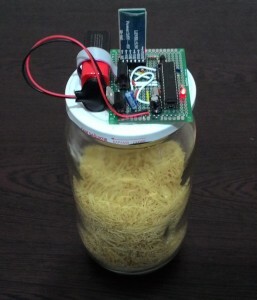 You should really have a look at what they did – they even documented how to create your own PCB for the jar monitoring device! This is a very complete project and I think I will probably try to replicate it myself 🙂 . I do hope Emir and Utku will take the idea further, and maybe do a Kickstarter some day! Emir and his team win $500, a full MicroEJ license and 2 Cortex-M4 development boards. IoNeeds projesini IoT Line Fair’da da sergiliyor olacağız. Mutlaka gelin ve IoNeeds’in çalışan halini inceleyin. Şimdilik görüşmek üzere. © This post is licensed under a Creative Commons Attribution-NonCommercial 4.0 International License，please give source if you wish to quote or reproduce. This post was published 1440 days ago, content in the post may be inaccurate, even wrong now, please take risk yourself.